Here, I've glued on the doors of the barn. Strangely, the directions in the book don't actually state when the doors should be installed. After the walls are up? Maybe. I thought it would be easier to install them while the barn pieces were still horizontal. Next up, the hayloft. After waiting a few hours to make sure the barn doors were glued on tight with the icing, I flipped it over then installed the 'shelf' that will make up the hayloft, with three supports under it it keep it in place. 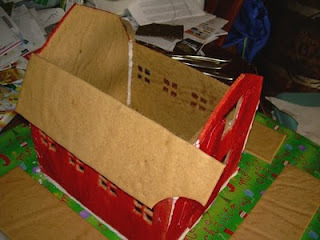 At about this time, I realized that the edges of the gingerbread pieces would be visible, and look strangely out of place once it was surrounded by red barn pieces. So I went through with my food coloring marker and turned the edges red. It was easier than 'painting' like I did with the faces of the pieces. Then iced and pushed up the fourth wall. The barn now has walls! 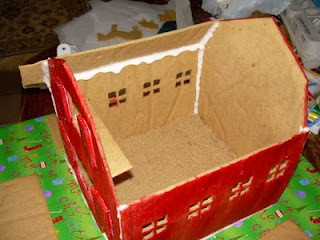 Here's a look at the inside of the barn so far. At about this point, I finally figured out why the book suggested that I wrap the board with "brown paper." 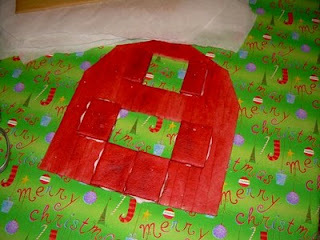 If you notice, looking through the holes in the front of the barn, you can see the wrapping paper through it. 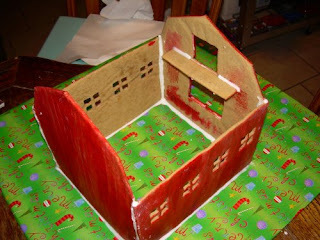 Well, when the barn is done, you'll be able to look in the windows from the other direction and see that the barn floor is a bunch of wrapping paper that says "Merry Christmas!" Not very authentic-looking, really. Oops. 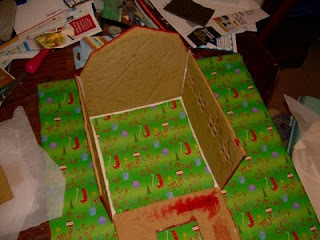 I thought all of the wrapping paper would be covered by the time I finished, but I forgot about the inside of the barn. Another problem started showing itself. 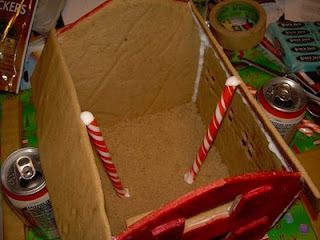 The gingerbread is a bit less than completely stiff, and the walls--especially the front and the back walls, started to bend and warp under their weight. 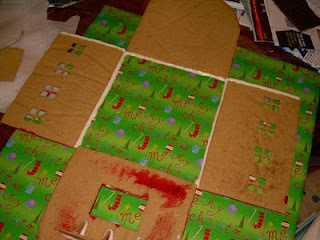 Once the icing dried, I figured each of the walls essentially would help prop the other ones it touched up. 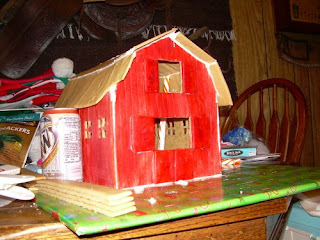 In the meantime, the barn was starting to sag! And gravity was slowing pulling the walls away from each other. I needed the pieces to stay put while the icing dried. So I arranged a bunch of knives (and scissors) to hold all of the pieces together. 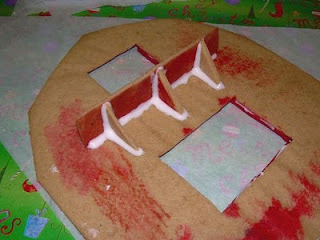 Mostly a matter of "gently nudging" all of the pieces into their correct positions until the icing dried. Here's how it looked from the outside. I did this part late last night, just before going to sleep, so everything should be crisp and dry by the time I woke up again this morning. Worked great! 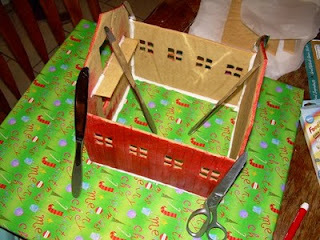 I removed all of the knives (and scissors) from their positions, then set out to deal with the "Merry Christmas" problem on the floor of the barn. My mom suggested sprinkling brown sugar over it to look like compacted dirt. Perfect! 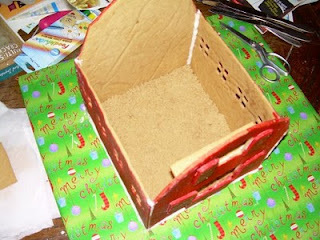 So I pulled out some brown sugar and created a floor for the barn. 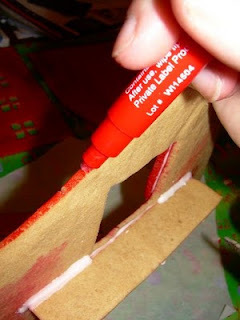 The directions in the book did not include this step--this was an invention of necessity! Next it was time to start installing the roof. I applied the icing quite liberally on the inside joints. I didn't worry if the icing started to drip or looked terrible. It wouldn't be noticeable once everything was done. Here I've installed the first of the four roof pieces. Here's a view of that first roof piece from the other direction. If you're wondering about that notch in the roof, that's where the silo will be installed. 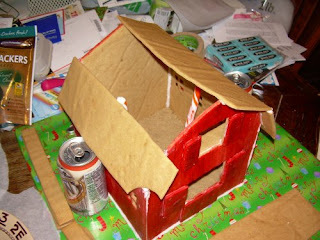 After installed the first two bottom roof pieces, I set soda cans under the edge of them to make sure the pieces didn't slide off as the icing was drying. You can see the soda can in previous pictures, but it wasn't as obvious as this one what its purpose was. I let the first two roof pieces dry for several hours before I went back to install the rest of the roof pieces. In the photo above, there's only one roof piece left to be installed. The stacks of "lumber" you see in the foreground of this last photo will be used to make the silo. I wish I had as much "free" time as you do. I'm loving this blog. Keep up the good work. Wow! 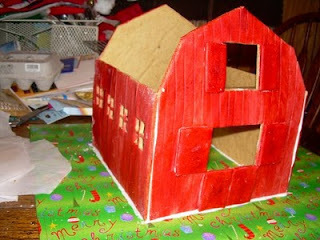 This barn is gonna be nicer than my real barn here at home! Great job! 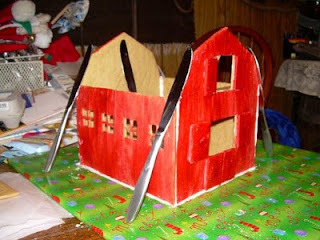 Are any animals going to be living within the barn when it's done? Loving seeing the process of this creative endeavour. I went this week to the grove park inn to see some absolutely amazing gingerbread houses. This is part of my holiday traditions. Thanks for sharing.